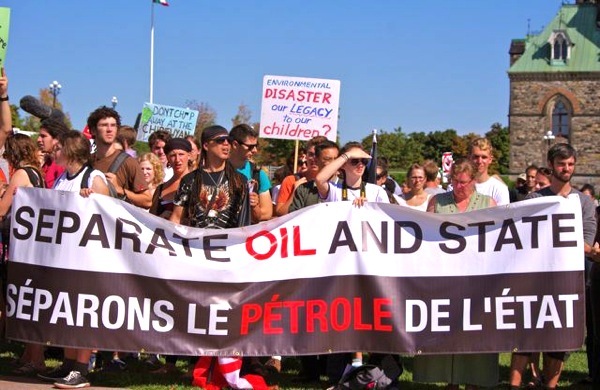 Oil sands protest Sept 2013, Ottawa, via YouTube. Brewing disputes with First Nations, claims of mercury pollution and increasing challenges for delivering oil to distant markets are only some of the challenges Canada’s oil sands will face this year, a report released Thursday shows. According to the study, produced by US-based Industrial Info Resources (IIR), with more markets opening up to Alberta crude oil, pipelines headed east, west and south are giving producers plenty of options in choosing a market. The problem is, analysts warn, there are too many issues surrounding the province’s oil sands, from simmering disputes between natives and the local and federal governments to growing concerns over the environmental impact of mining the deposits. In the last year and a half, the federal and provincial authorities have rewritten the book on resource development. Everything from how First Nations should be consulted to land use to oil sands monitoring to the basic regulations for environmental assessment have changed. Ottawa even said in October that it would invest about $24 million in a two-year international ad campaign to counter “intense and sustained public relations” attacks against Alberta’s oil sands. While official sources claim the new ground rules are a huge improvement in terms of efficiency and transparency, Canadian Press reports aboriginals are preparing a long list of lawsuits either now or soon to be before the courts. Natives says the say virtually every one of the many recent policy changes violates their rights and ignores their recommendations. “All litigation, all the time, is what I see on the horizon,” Larry Innes, lawyer for the Athabasca Chipewyan First Nation, was quoted as saying. Oil sands producers will also have to deal with environmental worries, which deepened last month after Environment Canada found that mercury levels around the oil sands were up to 16 times higher than “background” quantities for the region. Environmentalists say that extracting oil from the sands will lead to an increase in carbon emissions, the destruction of the land, water contamination and health problems for Canadians. The debate over the tar sands crossed over into the US when energy company TransCanada proposed building the Keystone XL pipeline to transport crude oil for refining and distribution across the border. While the mercury levels found around the sands are still lower than in other parts of Canada (notably around coal plants and incinerators), mercury is particularly worrisome to environmentalists because it can bio accumulate, meaning it becomes more concentrated as it works its way up the food chain.